Are you looking for a home away from home with more freedom and privacy than a hotel room or condominium? Explore our selection of Mont Tremblant chalet rentals and private vacation homes to find the accommodation that is right for you. Tremblant Sunstar is pleased to offer a wonderful selection of Mont Tremblant chalet rentals for your next visit to Mont Tremblant. Whatever your taste or budget let Tremblant Sunstar match you with the perfect Tremblant Chalet rentals. Browse the very best in Tremblant Chalet rentals and accommodation options by choosing a specific property or selecting the number of bedrooms you are looking for below. 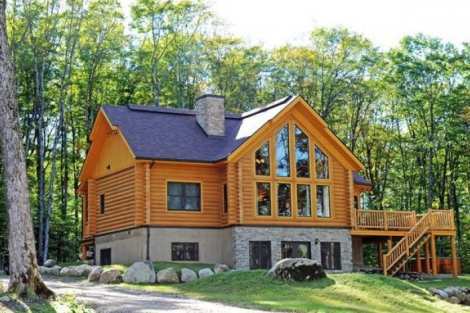 A large, beautiful log cabin nestled on two acres of maple forest. This five-bedroom, three-bathroom property is a dream come true for visitors who want to rest and play. It's ideal for those who want to take advantage of the wide array activities available in Mont-Tremblant but also want to be able to withdraw to a calm oasis. A seven-minute drive along Tremblant Lake leads to the heart of the Tremblant pedestrian village, at the foot of the ski slopes.In this highly private residence, you'll find refined furnishings throughout. The cathedral ceiling gives the main room a spacious, airy feeling. The inviting living room is equipped with a wood-burning fireplace and features large windows. The kitchen offers everything you need to prepare simple or more elaborate meals. The dining room, with its lovely round table just right for fostering togetherness, is located in an alcove with a generous window arrangement.The cozy master bedroom includes a private bathroom. The main floor has a bathroom with shower and three bedrooms: one with a king-size bed, one with two twin beds, and a third with twin bunk beds. This cottage is very well equipped for home entertainment, with a pool table, home cinema, infrared dry sauna and private outdoor hot tub.Wireless access to high-speed internet is included. In summer, the air conditioning and the large patio with barbecue are greatly appreciated.